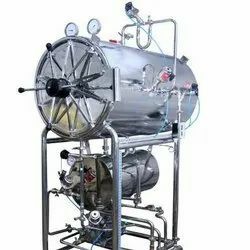 Providing you the best range of stainless steel autoclaves and flat sterilization roll for steam & eto sterilization with effective & timely delivery. We manufacture both Autoclave Steam Sterilizer For Micro Laboratories, which can be further customized in order to match specific requirements of our customers. The scope of customization includes construction material, automation and printer options. These units can also be constructed with vacuum drying option through vacuum pump. Our each autoclave unit provides highly satisfactory performance and competitive price guarantee. Flat sterilization rolls are generally used for autoclave & ETO sterilization process for packaging purpose. Medical grade paper available in both 60 GSM & 70 GSM. Film is available in tinted Blue/Tinted Green, & Natural. With two indicators for steam & ETO sterilization. * Reduces fiber peel and the risk of damage of sealing integrity while loading, stocking and transporting. * Print with water based link, going as natural as we could be! Packaging Details: IT COMES WITH STANDARD PACKING. Looking for Autoclave & ETO Sterilization Roll ?